I don’t mean to sound racist, but I’ve got a problem with white people. I usually say this as a joke to my friends and family members, most of whom are also white, but I think the reason that this seems to be a joke is because so many of us rurals think of whiteness as being the default, so much so that we often aren’t even aware of our whiteness (our skin color, but also our cultural choices, not to mention our privileges). I suspect this is why some of my white conservative acquaintances sneer about “political correctness” — white people out here are so used to only talking to other whites that they don’t often think how their words and statements would feel to people of other races. My grandma didn’t think calling my wife a “dago” would offend her, but by pointing out my suburban-born wife’s difference from my family’s ruralness, my wife did feel hurt. I particularly enjoy “You must listen to that rural music, right?” and “You don’t sound like a dumb hick at all!” (which, of course, a lot of my fellow rurals can’t carry off). “We have got this tailspin of culture, in our inner cities in particular, of men not working and just generations of men not even thinking about working or learning the value and the culture of work, and so there is a real culture problem here that has to be dealt with,” he said. 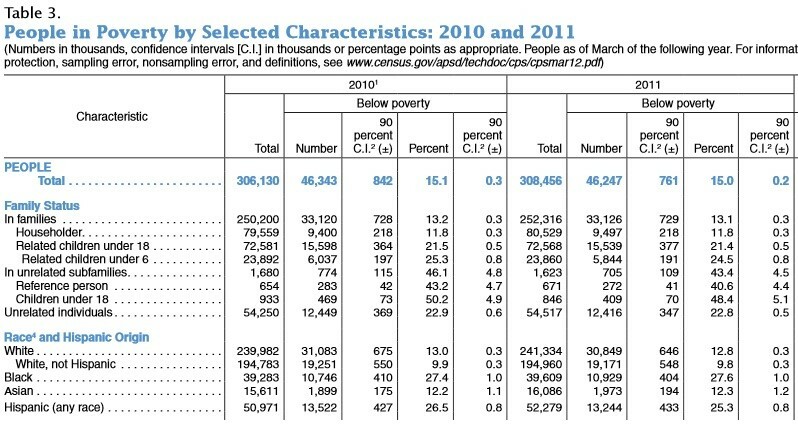 More than 19 million whites were considered to be in poverty in 2010 and 2011, millions more than the poor of any other race. And while people of nonwhite groups can show how they’ve been harmed economically by a history of discrimination (as pointed out here), white people can’t offer a similarly systemic cause for their poverty. So, what’s the reason for white poverty, white people? Is there also a culture of poverty among poor whites? And can we include country music in this “tailspin of culture”? This entry was posted in Links, Nonfiction, Ogle County Poet Laureate and tagged black people, poverty, racism, racists, rural poverty, white people, white poverty. Bookmark the permalink. I’m not surprised by the U.S. Census report. I’ve always noticed that the majority of beggars and homeless have been Caucasians. I find this stunning as African-Americans and non-whites are the ones clearly discriminated against (whether we want to believe it or not), yet somehow, they still find work and do what it takes to make a home. If they can do it, then what is the excuse for Caucasians? Interesting point! Homelessness is one of those problems that seems amazing that it still exists in a country as wealthy as the U.S. I went to Freshly Pressed and didn’t see this one there. Hmmmm…? Yeah, we who live in small towns/rural areas are pretty isolated from the real world. But if we don’t hear/see/live anything different, then it doesn’t exist. It’s a very human conclusion. People have to put themselves out to understand someone else’s world, and even then, only imperfectly. For me, it’s succinctly epitomized by the fact that no other ethnicity has come up with a derogatory name for Whites. “Honky” just never really made the grade; there’s no insult in it. It’s just word. They need to come up with something more meaningful. Well, I’m not sure about the derogatory term thing. A lot of terms could be derogatory, given the right context.